BOSTON—Significant opportunities exist for industrial manufacturers to differentiate their products and services and improve worker efficiency across their factory operations by leveraging IIoT technologies. According to a recent report from Deloitte and the Manufacturing Institute, advanced technology and digital skills must blend with uniquely human skills to yield the highest level of productivity. 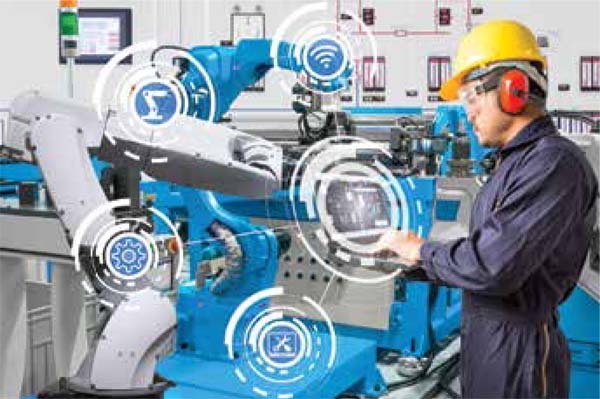 The latest version of PTC’s ThingWorx® Industrial Internet of Things (IIoT) platform rolls out new capabilities that are designed to increase productivity of factory workers. ThingWorx 8.4 introduces Operator Advisor, designed to increase productivity of factory workers by simplifying the way critical operational data is collected, synthesized, and delivered. Operator Advisor is said to help manufacturers improve workforce productivity by simplifying the delivery of digital work instructions in context, eliminating static paper and PDF-based instructions. The capability can also gather data as workers complete tasks for product genealogy and increase visibility into factory operations. Operator Advisor brings IT and OT systems together and connects to smart tools and machines to create a unified operator screen, PTC said in a press release. PTC’s momentum in the IIoT market, particularly within manufacturing, has led to the acceptance and adoption of ThingWorx by customers, systems integrators, and strategic partners around the world. Colfax, Elekta, Lavifood, Sealed Air, Vestas, and Woodward represent a sampling of prominent organizations that are said to have found success with ThingWorx and IIoT. ThingWorx 8.4 is reported to include additional key enhancements to empower organizations to quickly capture value from their IIoT implementations. An updated user interface for the ThingWorx Mashup Builder tool is said to make it easier to rapidly build and maintain IIoT solutions. ThingWorx Flow advances sourcing, synthesizing, and feeding data workflow into relevant business systems, while triggering important actions and providing alerts to end users. Organizations can also scale ThingWorx for broader enterprise deployments. ThingWorx now seamlessly integrates with InfluxDB and Microsoft Azure SQL for persistence and time series data management. Another enhancement is FactoryTalk Innovation Suite, powered by PTC, Integrations. The result of a collaboration with Rockwell Automation, it is said to offer enhanced features and tighter integration, enabling industrial companies to further optimize operations and enhance productivity with data and insights from IT and OT applications and systems. A key differentiator for PTC is the integration of its ThingWorx IIoT and Vuforia® augmented reality (AR) technologies. Work instructions from the new Operator Advisor capability, for example, can be delivered via an AR experience to provide an immersive, productivity-enhancing experience for a front-line worker.